In parametric optimization with unknown parameters, does a better estimator of the parameter always lead to better solutions to the actual problem? , and we’re comparing them in a mean square error sense (or by some other loss function in general). One would like to believe that better estimates lead to better answers, but the word “always” is a deal-breaker. Well, with one exception. The answer to the question is (trivially) yes if “better estimator” is interpreted to mean “estimator yielding better objective value”. For mean square error or any other likely loss function, though, “better” is going to mean “closer to θ” (in some sense of “closer”), and that’s when things fall apart. I’m going to take a couple of liberties in my answer. First, I’m going to change minimization of f to maximization, just because it makes the pictures a little easier to interpret. Clearly that makes no meaningful difference. Second, I’m going to assume that maximization of f is constrained. I can cobble together a similar but unconstrained counterexample by replacing the constraints with a penalty function (and assuming some bounds on the domain of θ), but the constrained counterexample is (I think) easier to understand. I deliberately wrote the sign constraints x≥0,y≥0 “backwards” to fit Figure 1 below. The red dashed vector represents a possible realization of the parameter θ. Since we’re maximize, f increases in the direction that θ points, so for this particular realization vertex B is the unique optimum. 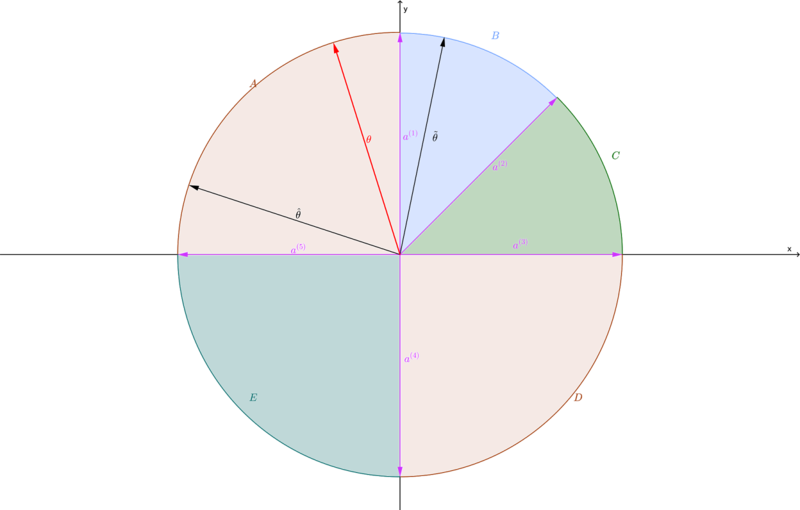 Note that θ in Figure 1 is between a(1) and a2. This is not a coincidence. If θ is parallel to one of the constraint normals a(j), all points on the edge corresponding to that constraint will be optimal. If θ lies strictly between two constraint normals, the vertex where their edges intersect will be the unique optimum. This is easy to prove (but I won’t bother proving it here). 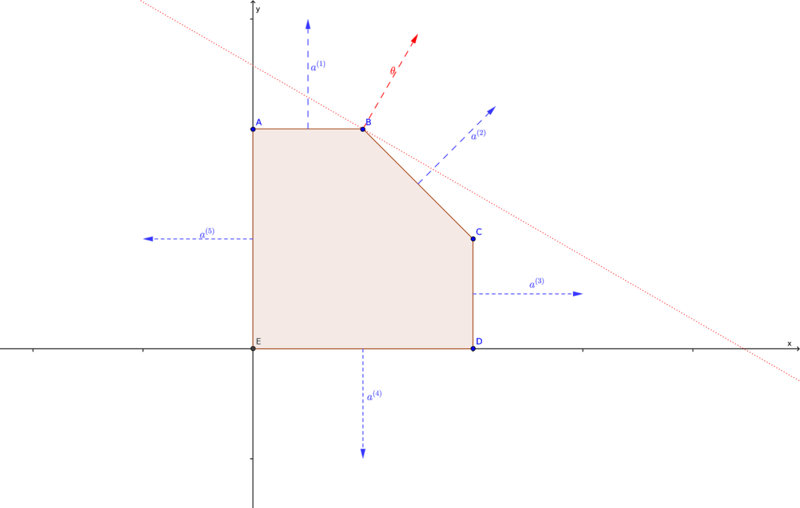 Figure 2 shows this situation in the same two dimensional space. The five constraint normals divide the space into five circular cones, with each cone corresponding to a vertex. If θ lands in the interior of a cone, that vertex is optimal. If it falls on an edge between two cones, both the corresponding vertices (and all points along the edge between them) are optimal. By design, I’ve selected them so that ~θ is geometrically closer to θ than ^θ is. That should make ~θ the better estimator of the two in terms of squared error, absolute deviation (L1 error), etc. Unfortunately, using ~θ results in vertex B being the unique optimum. Using the true coefficient vector θ, vertex A is optimal, and the seemingly inferior estimator ^θ also falls in the cone where A is optimal. Thus using the “inferior” estimator ^θ gets you the correct answer, albeit with a somewhat incorrect prediction for the value of the objective function. Using the “superior” estimator ~θ gets you a flat-out suboptimal solution. In Figure 1, the incorrect solution B looks to be not too far (geometrically) from the correct solution A, but I could easily cook this example so that B is a long way from A, guaranteeing a massively incorrect result. All that said, I would still gravitate to the more accurate estimator and not sweat the occasional pathological outcome. Sadly, though, there is once again no guarantee that doing the right thing leads to the best result.